72 members of the Bnei Menashe community make aliyah, recite Shema. Beginning of year-long campaign to bring hundreds of members to Israel. 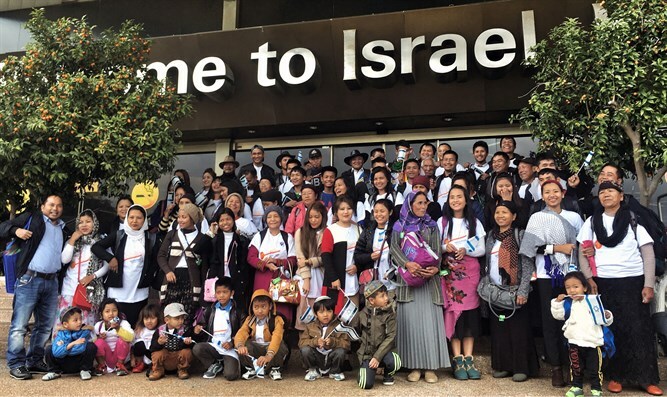 Seventy-two new immigrants from the Bnei Menashe Jewish community in India arrived in Israel for the first time Thursday morning. They joined 30 other members of the Bnei Menashe community who were brought to Israel by the Shavei Israel organization this week, in cooperation with the Immigrant Absorption Ministry. The immigrants came from the northeastern Indian state of Mizoram. All 102 immigrants will reside in Nazareth, which is already home to hundreds of members of the Bnei Menashe community. Upon arriving at Ben Gurion Airport, the olim (immigrants to Israel) recited the Shema prayer for the first time in the land of Israel. Shavei Israel Founder and CEO Michael Freund said that the arrival of the 102 olim marked the start of Operation Menashe 2017. The Bnei Menashe believe that they are descended from the Biblical Israelite tribe of Menashe, which was one of the ten lost tribes which was exiled from the land of Israel by the Assyrian Empire about 2,700 years ago. Former Sephardic Chief Rabbi Shlomo Amar ruled in 2005 that the Bnei Menashe were descended from the ten lost tribes, paving the way for them to make aliyah in larger numbers.